A classic side dish made with julienned, dried daikon radish that is fully reconstituted and stewed with light, elegant seasonings. The term kiriboshi (literally “cut-dry”) refers to julienned and dried daikon radish, which contains lots of fiber. This item also contains chikuwa and aburaage, which are cooked with the radish over time in a dashi soup stock broth that was made using katsuobushi (chikuwa is a steamed or broiled tube-shaped fish product, and aburaage is essentially fried tofu). Fresh daikon radish is easy to use and is sometimes even consumed raw, but preparing it kiriboshi-style can be a time-consuming process; and depending on your locale fresh daikon may be difficult to come by in stores. Sugarlady’s frozen kiriboshi daikon-ni allows you to enjoy this delicious dish in just moments, even on your busiest days; and without the need to worry about perishable ingredients such as the chikuwa spoiling! Many similar commercially available items are seasoned with chemical seasonings. Without defrosting the kiriboshi daikon-ni, use scissors to make a cut in the end of the bag for air to escape; then place in the microwave.Approximate cooking times: 2 minutes in a 500W microwave, or 1 minute 30 seconds in a 600W microwave.Our kiriboshi daikon-ni makes a great side dish, and can also be served atop rice or noodle dishes for flavor. This product contains kiriboshi (julienned and dried) daikon radish (China), chikuwa, aburaage, refined sake, sugar, soy sauce (contains wheat), hon-mirin, flavor (katsuobushi, kombu seaweed).. 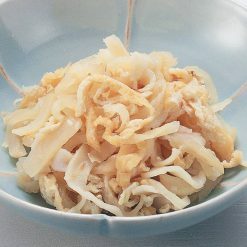 Origin of ingredients: dried daikon radish (China). Prepared and packaged in Japan.